Caretaker manager Roberto di Matteo deserves to stay in charge of Champions League finalists Chelsea for at least another year, says ex-boss Avram Grant. The 10-man Blues beat Barcelona in an epic semi final with a 2-2 draw in the Nou Camp to seal a 3-2 aggregate win. Grant, who was sacked despite leading Chelsea to the 2008 final, said owner Roman Abramovich was hard to predict. 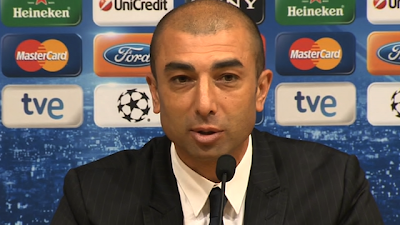 Former Chelsea midfielder Di Matteo was appointed interim manager until the end of the season after Abramovich fired Andre Villas Boas at the start of march. Grant said Abramovich will have been impressed that the Italian has turned around Chelsea's fortunes, guiding them to the Champions League and FA Cup finals. Di Matteo's record so far, with a 66% win rate, mirrors that of Grant, who left after eight months as manager following Chelsea's 2008 Champions League final defeat on penalties to Manchester United. The Israeli, a friend of Abramovich, initially joined Chelsea as director of football but was appointed manager in September 2007 after Jose Mourinho's dismissal. Grant was replaced by Brazilian Luiz Felipe Scolari, who lasted for seven months before Carlo Ancelotti was drafted in. The Italian secured the Premier League-FA Cup double in 2010 but was sacked a year later after a trophy-less season, and the same fate befell Villas-Boas after less than nine months in charge. So do u think Di Matteo deserves to be Chelsea coach permanently?